Three square metres of Arctic sea ice are lost for every ton of carbon dioxide emitted by anyone on our planet, a new study finds. The rapid shrinking of the Arctic sea ice is the most apparent consequence of global warming, with over half of the sea ice area having been lost in the past 40 years. The Paris agreement on climate change takes effect from this week. But will its targets be sufficient to save the Arctic from an ice-free summer? To address this question, Dirk Notz from the Max Planck Institute for Metrology and Julienne Stroeve from the National Snow and Ice Data Centre in Colorado analysed carbon dioxide (CO2) emission records as well as climate models. 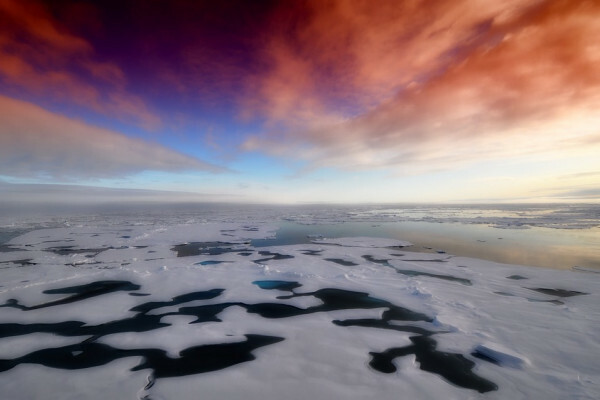 Their study, published in Science, reveals a linear correlation between the amount of CO2 emitted and the loss of sea ice area, meaning that for each ton of CO2, no matter where on Earth it is emitted, 3 square metres of ice disappear. "This allows us for the first time to really intuitively grasp our individual contributions to climate change," Notz says. With a carbon footprint of 10 tons, the average European is responsible for the loss of 30 square metres of Arctic sea ice per year. A trip from London to New York and back costs three square metres. The retreat of sea ice happens much faster than most climate models predicted, because the previous models underestimate the atmospheric warming in the Arctic. The Arctic sea ice could be preserved if global warming was limited to 1.5 degree Celsius, a target mentioned in the Paris agreement. But as soon as global warming hits two degrees, the sea ice will be gone. At the current rate of emissions, ice free arctic summers could already happen in two to three decades. "It always feels strange to show pictures to my children knowing that once they are my age that might all be gone." Ice-free arctic summers would pose a threat to the Arctic ecosystem, diminishing the habitat for species like seals or polar bears. From a climate perspective, the Arctic ice acts as a sunlight mirror to keep the Northern hemisphere cool. "There are a number of studies out there now which suggest that [...] we might observe more extreme weather events for example in central Europe, in the US, in Canada, throughout Russia, simply because the sea ice in the Arctic is disappearing." On the other hand, a reduced sea ice area opens up new shipping routes and possibly access to oil and gas reserves, which highlights the complexity of the issue involving multiple players with contrasting interests. Predicting the exact consequences an ice-free Arctic would have is impossible, which is why Notz calls for a significant reduction in CO2 emissions. "Changing your lifestyle does have an impact, so for example if you drive your car a little bit less or if you fly a little bit less. Knowing how much sea ice this change of lifestyle preserves may be a very strong motivator for people to take action."